Accuracy -- Long Life -- Convenience with a Delta 10" Unisaw! 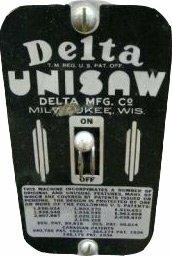 The Delta Unisaw has been one of the mainstays in home and industrial wood shops for over 60 years. 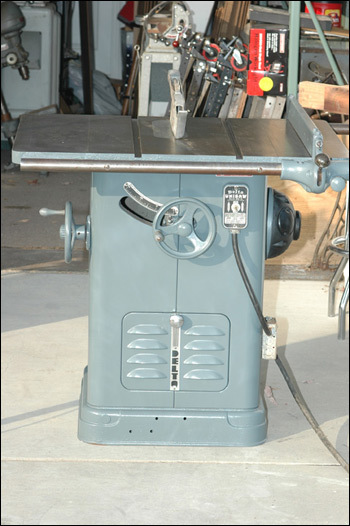 No woodshop should be without one. Share your Unisaw Pictures with other visitors to this site. 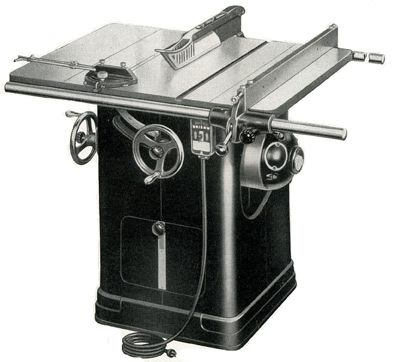 In 1949, the Delta-Milwaukee 10" Tilting Arbor Circular Saw was a completely self-contained motor and driving mechanism in a strong steel cabinet type base. 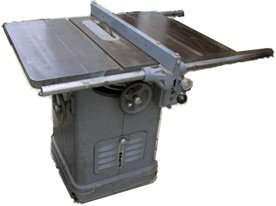 The saw table was 20 x 27 inches with optional cast iron extension wings that made it 36" wide by 27" deep. With the standard rails and rip fence, it cut to the center of a 50" panel and ripped stock up to 3 1/8" thick. The saw blade tilted 45 degrees to the right, operated by a large convenient hand wheel. The blade was raised and lowered by another hand wheel at the front of the saw cabinet. Dado heads, molding cutters and many other attachments could be used to add to the versatility of the Unisaw. The carriage swung on trunions that were large, heavy, and strong with working surfaces completely machined. The rip fence bar extended over the rear edge of the table and the fence locked both front and rear, the rear lock being operated from the front of the fence. The standard guide bars allowed the fence to be moved 25" to the right of the saw blade and 15" to the left of the blade. The front guide bar was graduated for quick setting of the fence. It also featured a micro adjust knob for fine movements. The saw arbor bracket was a very heavy casting, with accurately machined teeth to fit the raising and lowering worm gear, and with accurate adjustable stops to limit up and down travel. The shaft was carried in two sealed-for-life ball bearings mounted in diamond bored bearing seats. Sometimes known as the Goose Egg cover because of its shape, the heavy cast iron motor cover enclosed the opening in which the motor swung. It also provided weight and an additional safety factor for the machine. Cast iron extension wings were available that bolt on to the sides of the Unisaw table top. These 8" wide by 27" extensions madet the table a full 36" wide when bolted to each side. Note the "LTA-402" designation on the underneath side of the extension wing castings. The LTA part number prefix was designated by Delta for all parts having to do with the Unisaw. The No. 1471 Super-Safe splitter-mounted guard was anchored directly to the arbor bracket so that when the saw is tilted the guard follows the saw blade - thus complete protection was always assured no mater what angle the saw was set. The miter gage has a 7 inch face and a 3/8 x 3/4 x 18 inch bar which fits the table slot of circular saws and other machines. It can be set at any angle up to 60 degrees to the right or left, and it has adjustable stops for instantaneous settings at zero and 45 degrees to the right or left. It can be adjusted to compensate for wear or loosening the head by merely loosening or tightening a tapered pivot screw. No. 865 Clamp Attachment for Miter Gage with Clamp Bar, two Sliding Clamp Screws and Front and Rear Posts. No. 863 Extra Clamp Screw and Block for Clamp Attach. Tenoner makes all cuts safe, square, and parallel. Work is fed to the saw with one hand - far removed from the revolving blade. The tenoner will take stock up to 2 3/4" thick, any width within the capacity of the saw, and will cut tenons to full capacity of saw. With the use of the No. 1171 spacing collars and an extra saw blade, 1/4" or 3/8" tenons can be cut in a single pass. Big, Perfectly True Table Surface, 27" x 36"
No useless weight - only 334 lbs. Ample space in front of blade - a dull 12"
Diameter of Arbor - 5/8"
Diameter of saw blade - 10"
Maximum depth of cut - 3 1/8"
Cuts to center of panel (max width) - 50"
Table size - 20" x 27"
Table size with extensions - 36" x 27"
To right of blade - 25"
To left of blade - 15"
Table in front of blade - 12 1/4"
Miter Gage groove in table - 3/8" x 3/'4"
Overall dimensions with Wings and Guide Bars - 30 1/4" x 45 3/8"